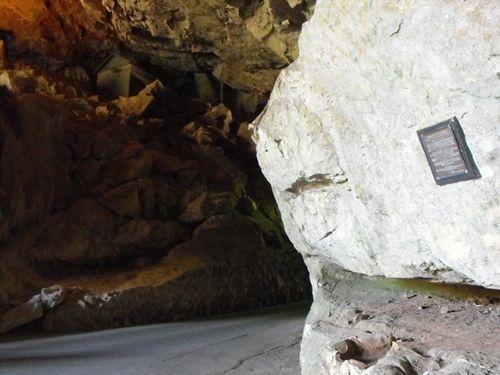 A plaque commemorates the European discovery of the most important caverns and acknowledges the pioneers who made these discoveries. For thousands of years, the Jenolan area has been part of the culture of local indigenous peoples. The area holds significance to the Gundungurra people, who knew it as 'Binomil' or 'Bin-oo-mur'. In approximately 1835-40 the area was recorded for the first time by either James, Charles or Alf Whalan, three brothers who each claimed to have discovered the caves while searching for a bushranger, James McKeown, whom they claimed used the caves as a hide-out. The caves, then known as the Fish River Caves, came under New South Wales Government control in 1866, becoming only the second area in the world reserved for the purpose of conservation and the following year Jeremiah Wilson was appointed as the first "Keeper of the Caves". Wilson not only explored the already known Elder and Lucas Caves but later discovered the Imperial, Left Imperial (now known as Chifley), Jersey and Jubilee Caves. The caves were open to tourism early, but there was little protection from visitors damaging formations until souveniring was banned in 1872. In 1884 the name Jenolan Caves was adopted. The name "Jenolan" comes from the Gundungurra word, "Genowlan", the for a "high place shaped like a foot". Professor Sir Edgeworth David will unveil a tablet in the Grand Arch, Jenolan Caves, on Saturday in commemoration of the discovery of the more important of the Jenolan series of caverns, and as a public acknowledgment of the work ot the pioneers in that regard. The Sydney Morning Herald (NSW), 18 February 1929. GRAND ARCHWAY. J WHALEN. 1841. LUCAS CAVE.N.WILSON. G WHALAN. G.FALLS 1858. TEMPLE OF BAAL. J.C.WIBURD & J. EDWARDS.1903. ORIENT CAVE. J.C.WIBURD. & J.EDWARDS. 1904. OLIVER TRICKETT.L.S.M.S. WHOSE SURVEYS AND PLANS HAVE CONTRIBUTED SO MUCH TO THEIR DEVELOPMENT .